These dogs are “shepherds.” They are the root stock behind the various dogs that have been called English shepherds, farm collies, and treeing farm shepherds. 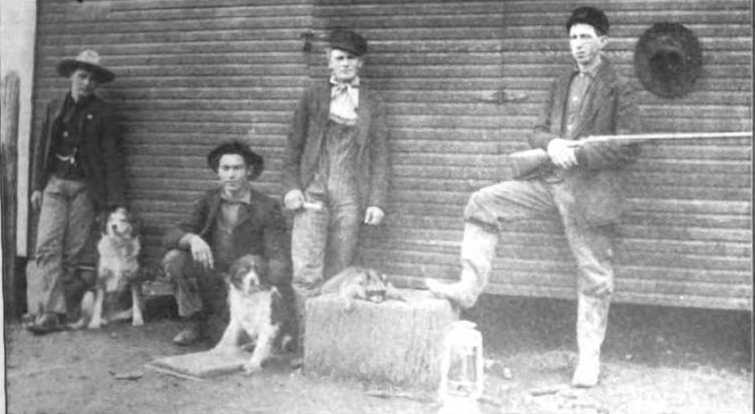 These particular dogs were photographed in Cardington, Ohio. These are the kind of dogs that many farm families in the Applachians and the Midwest kept. The couldn’t really afford to buy specialized hunting breeds from Europe, so they used their herding dogs to hunt game. These dogs were mostly derived from English, Irish, Welsh, and Scottish farm dogs, but they were also mixed with German, Swiss, and Native American dogs. Some people crossed them with greyhounds and curs, and many more crossed them with foxhounds and coonhounds. In some areas, the dogs were crossed with wolves— although one should keep in mind that no modern shepherd type has significant wolf ancestry. The dog on the left reminds me very much of Bull, the farm collie that my dad owned when I was very young. He was more into hunting and chasing than guarding or being a decent family pet. He also roamed extensively– something you can get away with if you live in the middle of nowhere in West Virginia. I have no doubt that he could have tangled with a raccoon and probably would have relished it. He could easily be induced to howling. All I had to do was hit the horn on any vehicle, and he’d throw back his head and let loose a few howls.